WordWright.biz proudly announces its latest release, Notorious Nora. 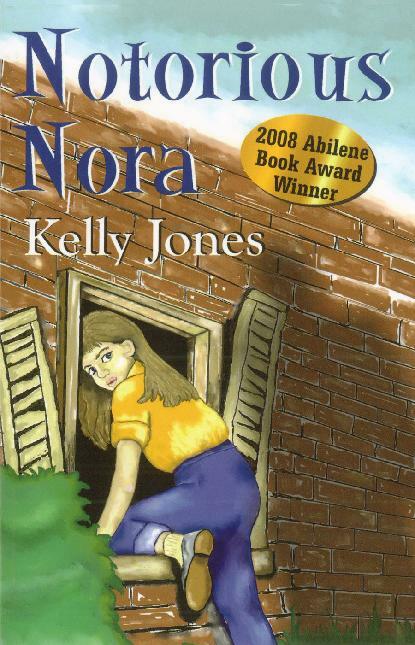 Written by nationally acclaimed children’s author Kelly Jones, Notorious Nora brings a whole new generation the fresh adventures of a young sleuth. With Notorious Nora, award winning author Kelly Jones, can add another award to her list of writing honors when she claims the 2008 Abilene Book Award on September 29 at the West Texas Book and Author Festival in Abilene, Texas. The middle reader adult novel will also make its debut on that day at the festival. Jones, the author of The Adventure Tree series for children, has set her sights on writing for older children with Notorious Nora, the first in a series of Notorious Nora mysteries for young readers. Notorious Nora picks up where past generations of young detectives have left off. She brings the art of the “Who done it?” into the 21st century. Her language is fresh and active, the story moves forward at a pace guaranteed to keep the attention of young readers, and they will be able to relate to her memorable characters. The values of friendship, honesty, and loyalty presented in Notorious Nora will also teach readers of their importance. Notorious Nora will be available in bookstores on October 1, and is available through most distribution channels including Ingram, Baker & Taylor, Brodart, and Bertram. The book will also be available at WordWright.biz, Amazon.com, BN.com, and other outlets. Note to booksellers: Books are returnable and all usual discounts apply. You may order through distribution channels or directly from the publisher. Winner of the "2008 ABILENE BOOK AWARD"
WordWright.biz and The West Texas Book Festival proudly announce the winner of the First Annual Abilene Book Award. Kelly Jones of The Woodlands, TX has won the 2008 Abilene Book Award for her manuscript, Notorious Nora and WordWright.biz has awarded Jones a traditional royalty publishing contract for that book. The book will debut at the 2007 West Texas Book and Music festival to be held in Abilene on September 28 and 29. As a featured author of the festival, Jones will visit schools, sign books and address the luncheon. Notorious Nora, a young adult novel, tells the story of a pre-teen girl, who with her friends solve the mystery of the stolen championship trophy. While an entertaining "who-dun-it", Notorious Nora also promotes values we all wish to engender in our children: loyalty, honesty, and perserverance. Notorious Nora will be available to booksellers beginning in September through the usual channels and readers will be able to buy copies at their favorite bookstore or over the internet from WordWright.biz or other sites. So mark your calendar for September 28 and 29 to plan to attend The West Texas Book and Music festival in Abilene to meet Kelly and take part in all of the excitement of a book debut.